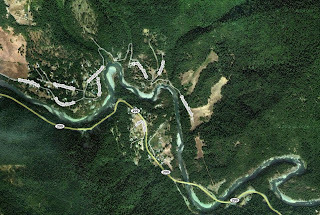 Along the Trinity River and Highway 299, just past the little town of Salyer, about five miles east of Willow Creek, is the area known traditionally as Oden Flat. Heading out of Salyer going east one enters a narrow bit of road hard up against a rock wall to the right and a deep cliff into the river canyon to the left, the road bends sharply to the left and then to the right at a 25 mph sign, and then straightens out at the top. This is the area where bigfoot activity has been going on of late. It is just about a mile from the sign announcing the roadside rest area ahead. "Fisherman" Ken Hodges and family visited Bigfoot Books last week to tell of rock-clacking heard in the woods around their home. 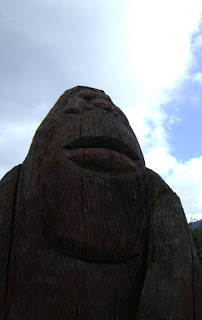 This has been going on for a while now, with Mr. Hodges speculating that the sasquatch has been hunting the many deer that use the property for transit from the hills to the south and the river to the north. 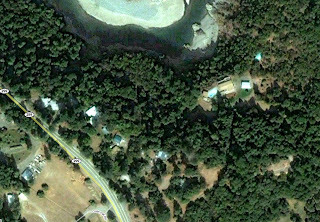 This is an area, as seen in the aerial photos above and below (click images below to enlarge area! ), that is very sparsely settled by humans but with ample wildlife habitat surrounding it. At dusk, on the evening of Sept. 11th, 2009, the family's kids were playing out in the yard enjoying the last of the late summer weather. The house is about 200 yards from the small State Route 299. A large creature was heard and then seen by the family's daughter (who looked to us to be about 12-13 years old). Whatever it was was partially obscured by bushes, about 30 to 40 feet away. At first she assumed it was a bear, but then it STOOD UP, and proved to be over seven feet tall, almost four feet wide. Her father entered the driveway after a few moments, and the creature fled away bipedally. The girl said the Bigfoot was certainly NOT a bear or any animal they are familiar with in their area. It was definitely taller than her 6-foot, 4-inch father. Though she could clearly see its hominoid form, the failing light did not allow her to get a good look at its facial features. It WAS looking at and facing her directly, though, and demonstrated an obvious curiosity about the kids playing in the yard. It had dark brown, not black, hair covering its body. This reiterates many other sighting reports we've had where a Bigfoot shows interest in children and women, but flees when a male human arrives on scene. The witnessing family were here in the store, and they made a very favorable impression on this reporter. Footprint depressions were found in the forest debris, but were not really castable due to their being made on leafy material. Mr. Hodges estimated them as quite large, pointing out on our ruler the length of an estimated 19 inches in length, 7 and 1/2 inches wide. We may be able to do on-the-ground investigation on this site, if there is any further activity. They seem open to it, though they don't want any strangers hunting around on their property. The family told of their friend, a Native American man named James, who the say is a "Bigfoot Magnet," so often does he encounter the beings. One time while sleeping on the ground up near Waterman Ridge and Horse Linto, outside of the Willow Creek area, he was hunkered down in his sleeping bag when he heard motion in the brush outside his camp area. The thing moved closer, eventually bending down and sniffing/smelling the sleeping bag and the man inside. The man moved and was able to see the startled creature as it loudly jumped down the bank. 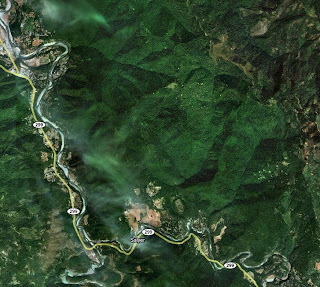 Occurring just a couple of weeks prior to the recent BFRO Redwood Expedition in Redwood National Park, we had a report come in of a bigfoot sighting on what the reporting individual says was "the new road into the (Redwood) park," just a couple or a few miles in, going east. The creature was seen in the roadbed, after twilight, and then it of course entered the forest as the driver drew near. 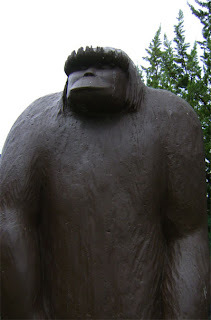 The usual details of a Bigfoot were described. But of most interest, this sighting confirms the BFRO's interest in activity in the area, and adds yet another report to the many others coming in over the last few years from that area. AND THIS: The most strange kind of report we get in here is the kind where the person starts talking, but then stops mid-story and seems to think better of telling further details. This often happens with the old-timers from around here. 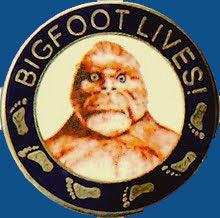 On this last Sunday we had a fellow come in who had grown up in Willow Creek area, and was old enough to recall the stories told by his elders of the 1958 activities up on Bluff Creek, as well as the events around the Patterson-Gimlin film event in 1967. He told me this, about "a taxidermist's shop in Anderson," and I chimed in, oh you mean Bob Titmus? He vaguely nodded, but then said he was "sworn to secrecy" by his brother who had seen something there. To paraphrase, he then said, Let me just say that if you didn't believe in this Bigfoot thing before, you'd certainly have to think twice after this. SO, WHAT did he see in Titmus' shop??? Could there have been some evidence not revealed to the public? A dead Bigfoot, perhaps? Well, we are waiting on needles and pins over this one. It could be a stunning revelation from a man who knew Titmus from outside of the bigfooting community, if the brother is willing to tell his story. 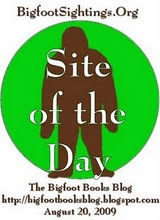 Read John Green's biographical EULOGY OF BOB TITMUS, or PETER BYRNE ON TITMUS, both found on the fabulous BIGFOOT ENCOUNTERS web site. Fascinating local Bigfoot sighting!!! Thanks for sharing that with us. I would love to get back over there to Willow Creek one of these days. 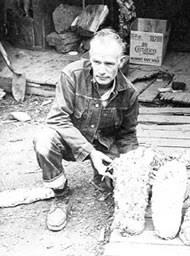 I'm also hoping we'll get to hear about what was in Bob Titmus' taxidermy shop. It is about time. He's not here anymore so who would object to having this secret told? Peter Byrne's skills as an outdoorsman have come under fire from another "legend" in the field..Robert Morgan. I think all of these men were like all humans in that they each had their own strengths and weaknesses.